"Foundation - An underlying basis or principle for something"
When breaking down the offense of the Ohio State football program under Urban Meyer, every gameplan since his hiring has started with one core concept: the Tight (or Inside) Zone. While the play can be found in the playbook of every single college and pro team, the concept truly acts as the starting point for the entire Buckeye offense. While we here at Eleven Warriors consistently reference the concept, we rarely give the Tight Zone the credit it's due, especially given the success with which the Buckeyes executed it last fall. Make no mistake, the Tight Zone can take credit for a huge chunk of the 4,321 yards the Buckeyes rushed for in 2013, even those from quarterbacks Braxton Miller and Kenny Guiton. The simplicity of the scheme is it's main attraction, as it can be run from virtually any formation regardless of personnel. While it appears that all a linemen needs to do here is block the closest man, there is much more that lies beneath the surface. The subtle complexities in alignment, footwork, and, most of all, teamwork allow the Buckeyes to run the same play over and over with success, even though it's the first play defenses are looking to stop. There are nearly as many ways to coach the Inside Zone as there are teams that run it. But, according to an XandOLabs.com poll of coaches, 63% like to line up with a two foot split between each offensive linemen. Some coaches, like Air Raid guru Mike Leach, prefer an even wider split to force the defensive ends to start even further from the ball. However, like the majority of coaches poled, Urban Meyer and OSU Offensive Line coach Ed Warinner prefer the smaller gap. More importantly though, is the depth that the OSU linemen try to create on the line of scrimmage. As seen below, the rest of the Buckeye linemen like to get as far back from the line as the rules allow. While the ball is spotted on the 20 yard line (as the black line for TV shows), all the Buckeye linemen besides the Center, Corey Linsley, are nearly a full yard behind the line. The reason for this is simple, leverage. This extra space gives the Buckeyes a chance to move laterally while still moving upfield toward the defender, gaining momentum in the process. From there, the Buckeyes survey their opponents. While the scheme relies on the fairly simple premise of linemen doing one thing if they're covered (an opponent lined up directly over them), and another if they're not, they must first determine where they're going. This is one area where coaches begin to differ in opinion. Some coaches determine the rules the line will follow depending on if the defense is lined up with an even (four defenders on the line) or odd (three or five on the line) front. Others that trace their roots back to Alex Gibbs, one of the pioneers of zone blocking with the Denver Broncos in the 90's, will identify defenders based on a count system, assigning blockers with numbers. In this case, the man closest to the ball is a "0" and will be blocked by the Center, the first defender outside of that on both sides is a "1" and will be blocked by the guard to that side, and so on out to the end of the line. But the Buckeyes identify the opponent's alignment based upon the location of the "3 technique" defensive tackle. This is the defender lined up in the gap between the guard and tackle (commonly known as the B gap) to one side, as seen in the diagram of defensive line positioning below. From there, the side of the formation where the 3 technique is present becomes known as the RED side, with the opposite side labeled as WHITE. Ideally, the Buckeyes would like to run the Inside Zone to the RED side, as there is a natural lane that exists in the "A" gap to that side, as there is no one lined up between the Center and Guard. By splitting the line into two halves, essentially a playside (RED) and a backside (WHITE), the linemen are split into two groups, and know both the defender and gap for which they're responsible, but also which teammates they know will be working with them on a combo block. In this case, the RED side Guard must block the 3 technique on his own, as the Tackle and Tight End combo block the 9 (Defensive End) before one of them breaks off to block the linebacker. On the WHITE side, the Center will combo block the 1 technique (Nose Tackle) with the Guard before taking on the middle linebacker, as the Tackle immediately goes upfield to block the linebacker to his side. In the Ohio State scheme, the 5 technique defensive end on the WHITE side is effectively blocked by Braxton Miller. While hopefully the two never make contact, this defender must stay home to protect against the chance that the quarterback keeps the ball and runs outside. If the defender begins to cheat and overplay the handoff, Miller's now speed will make the defense pay, thanks to the now (in)famous Zone-Read Option. 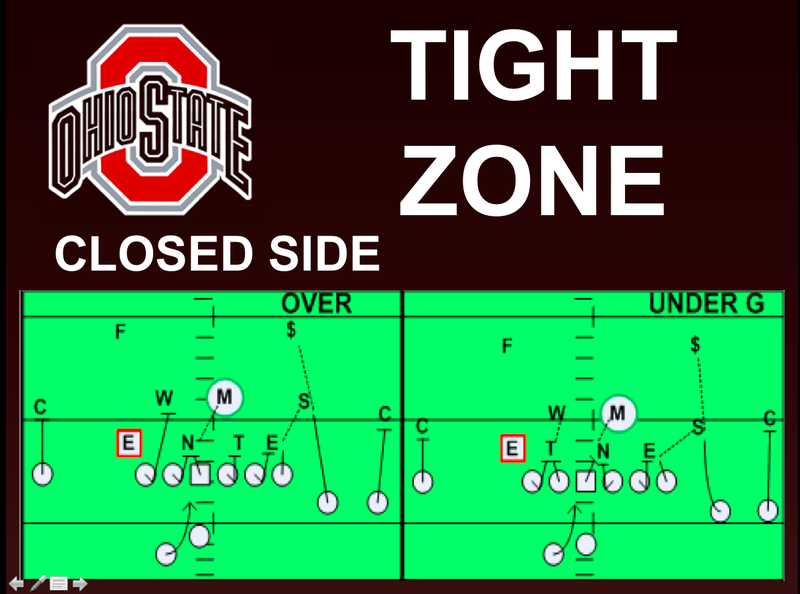 Knowing that the Buckeyes prefer to run the Inside Zone towards this gap, opponents will often set their alignment based on that of the OSU Running Back. Since the Buckeyes operate almost exclusively from the shotgun, the back is lined up next to the quarterback, and he is already headed in one direction when he receives the handoff. As such, the play gets blocked to the opposite side of his original alignment. As seen in the video above, the Buckeyes will often line up in the Pistol formation with the back behind Miller, not declaring one side or the other and preventing defenses from immediately plugging up the hole. Additionally, the Buckeyes will use the hand clap snap count to mess with the defense. OSU often snaps the ball after the QB claps his hands, but they'll often line up with the Running Back on one side of Miller, then motion him to the other side at the first clap and snapping the ball on the second. The offense is able to keep the defense off balance not only with the snap count, but with the entire alignment of the defensive front. Once the ball is snapped though, the play doesn't get any less complicated. 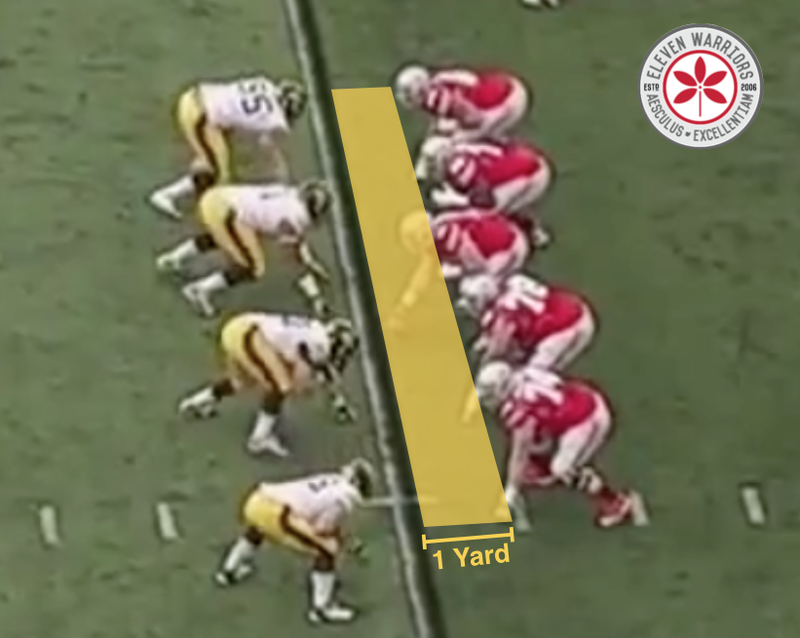 Next week, we'll take a look at the technique, steps, and rules the OSU offensive linemen use to block the Tight Zone.